Pros: A bold and compelling re-imagining that brings ancient plays to vivid life. Off-West prices in the heart of London. Cons: It was probably even better at the Almeida. But what’s the point of regret? Oresteias are like buses. You wait for ages and three come along at once. They’re also a journey through the underbelly of existence: justice and revenge, grief, sacrifice and responsibility. It’s all there. Much like the Night Bus. While across town the Globe’s version takes a traditional approach and HOME’s as-yet-unseen interpretation waits to spring into life in Manchester, Trafalgar Studios hosts director Robert Icke’s contemporary vision of the Greek trilogy that dazzled punters at the Almeida earlier in the year. Time governs this production even before it begins. Leaflets denoting the evening’s division into five acts are handed out beforehand, front of house repeat the information and, on stage, screens denote characters’ time of death – at the actual time in London on a Monday night. It’s eerie – like the Oresteia’s tentacles want to reach out and grab hold of your life. Given the creative smarts at work at the Almeida, I doubt that’s an accident. But this is not a rarified evening of high culture. Little knowledge is assumed and no smug nods to classicists litter the play. This is walk-up-like-it’s-a-new play level of re-imagined. The intensity and immediacy is almost over-whelming. The first act; a radical reworking of the trilogy’s first part which puts Agamemnon’s sacrifice of his daughter Iphigenia’s life for military advantage at the centre of the action, is achingly silent. The absence of sound, other than the performers’ voices, is almost a challenge put forward by the production. The rapt audience responded in kind. There was barely a rustle and none of usual cacophony of coughing. Lia Williams’ Klytemnestra embodies devoted, affectionate mother and vengeful, grief-maddened killer with equal ease and believability. It’s an extraordinary performance that’s both exhausting and exhilarating to watch. There’s no justice (and in this play, there’s always room for doubt) if she doesn’t carry off all the baubles come awards season. Angus Wright, as a military-politicio Agamemnon, is suitably unknowable and there must be more than an honorable mention of the show’s child actors. Clara Reid’s Iphigenia is the haunting centre of the drama. It’s a substantial role and her wistfulness and charm add to the heartbreak of her fate. 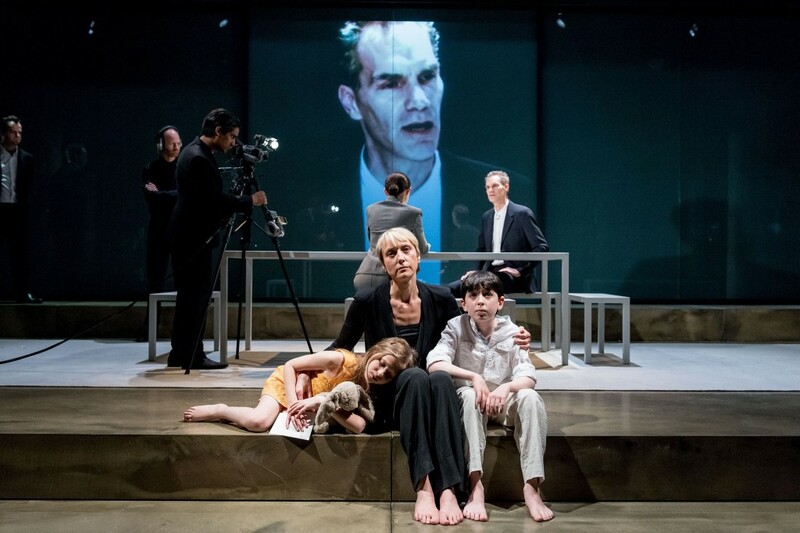 The Greek Chorus has been axed, replaced with a clever framing story that peppers the Oresteia’s final preoccupation – the establishment of trial by jury – through the play. It could feel contrived but in Robert Icke’s expert hands the device is crystal clear, compelling and ladles on more layers of meaning. Orestes’ evidence is an act of memory, a story: who can bare witness to the truth? Hildegard Bechtler’s set design and Natasha Chivers’ lighting beautifully bring this strange ancient-modern world to life. It feels both distant and familiar, with opaque sliding screen doors, so beloved of the well-heeled ‘perfect’ families that inhabit London’s townhouses, either masking or illuminating the action. The media (video by Tim Reid) interrogates Agamemnon’s actions and screens around the auditoria show its version of events. 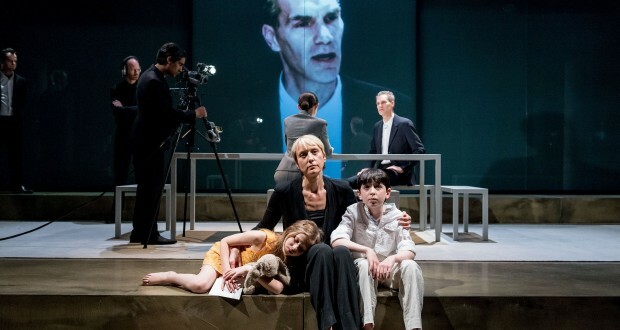 It’s clever, but one imagines the effect was punchier in the more intimate Almeida theatre. And sound, by Tom Gibbons, delivers the sucker-punch. Voices get subtle echoes and distortions, modern tunes unnerve and silence speaks volumes. The Oresteia may be 2,500 years old but, in the hands of this über-talented cast and creative team, this is a once-in-a-lifetime chance to witness drama at its very best. And you’ll still be feeling its effects long after you’ve disembarked from the Night Bus home. Sally is a recovering regional journalist from south Wales who's headed for the big smoke to work on magazines and definitely not to see way more drama. Honest. She keeps herself busy exploring off West End venues and will watch anything - anything - once. Thinks there's a special place in hell for people who talk during plays and please don't get her started on noisy sweet-eaters. She likes to tinker at the odd play or screenplay but mainly hopes to become the next Simon Stephens by quaffing wine on the balcony at the Young Vic.